For several years a leading Communist Party USA activist has been campaigning to honor the memory of late Chicano Farm Workers Union leader Cesar Chavez with a national holiday. But the campaign is working to extend the holiday nationwide. The campaign's director is Californian based activist Evelina Alarcon-who has held several senior positions in the Communist Party USA, including chair of the party's Southern California District and Secretary of its National Mexican American Equality Commission. Understandably Evelina Alarcon was over the moon in April 2008 when no less a figure than Democratic presidential primary candidate Barack Obama came out in support of a Cesar Chavez Holiday. From the Cesar Chavez National Holiday website. April 1, 2008 Washington DC--Evelina Alarcon, Executive Director of Cesar E. Chavez National Holiday welcomed the backing for a Cesar Chavez national holiday from Presidential candidate Senator Barack Obama who issued a statement on Cesar Chavez’s birthday Monday, March 31, 2008. Several others in Obama's circle are also big Cesar Chavez fans, including Los Angeles mayor and appointee to Obama's Transition Economic Advisory Board, Antonio Villaraigosa-who endorses the national holiday campaign. Villaraigosa marched with Chavez as a teenager and also worked for Chavez's friend and colleague, leading Southern California Communist Party member Bert Corona. 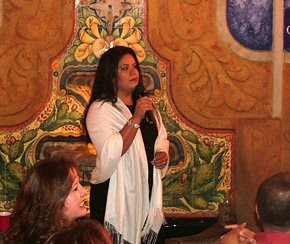 Villaraigosa is reportedly a close friend of both Evelina Alarcon and her brother Los Angeles Councilman Richard Alarcon. The Southern California Friends of the People's Weekly World tribute to two of Los Angeles' finest labor leaders, Jerry Acosta and Gilbert Cedillo, became a dynamic rally of elected officials, activists, labor and community leaders in solidarity with labor struggles and in the fight to defeat the ultra-right in November. Hilda Solis is now Obama's Labor Secretary and also a Cesar Chavez admirer. 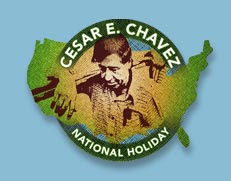 When still in the US Congress Solis sponsored House Resolution 76 which urges the establishment and observation of a legal public holiday in honor of Cesar Chavez. Not content with presidential candidate Obama's support, Evelina Alarcon went after another member of the Obama family-Barack Obama's younger sister Maya Soetoro-Ng. Evelina Alarcon (pictured below with Soetoro-Ng), a notable Obama supporter and the sister of long-time Los Angeles politician Richard Alarcon, presented a poster to Obama’s sister commemorating the life of Cesar Chavez. The anniversary of Cesar Chavez's birthday is due March 31. It will be very interesting to see what President Obama does to progress "notable Obama supporter" Evelina Alarcon's goal of a Cesar Chavez national holiday.